When it comes to cookies, I’m in the soft and chewy camp. When I worked at a big agency, I always looked forward to co-workers’ birthdays because it was an excuse to order that ridiculously gigantic chocolate chip cookie cake from Mrs. Fields…. warm, soft, and a little chewy like a brownie, plus it came in a cardboard pizza box that, once emptied, revealed its evil twin: an enormous footprint of grease. For my mom’s birthday, I thought about shipping her a giant cookie cake, but breakage was an obvious concern. 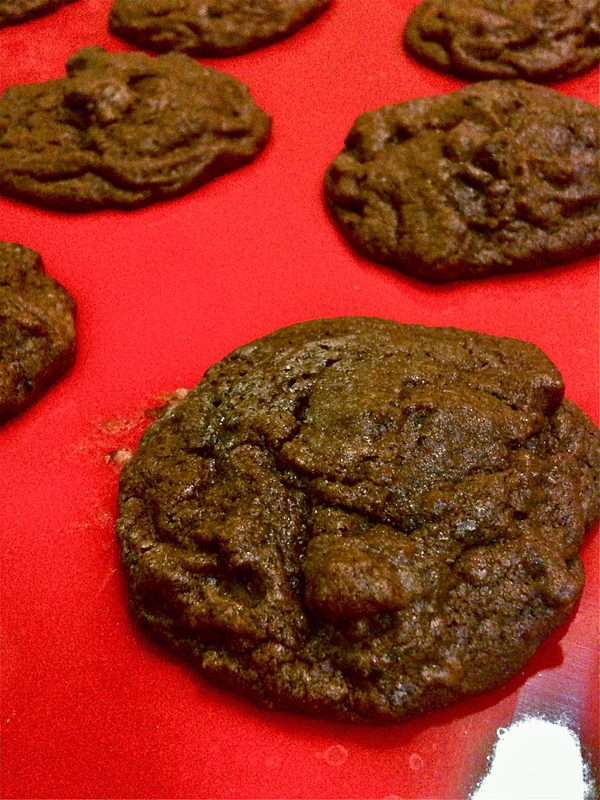 Instead, I sought out a dressed up cookie recipe worthy of a celebration. 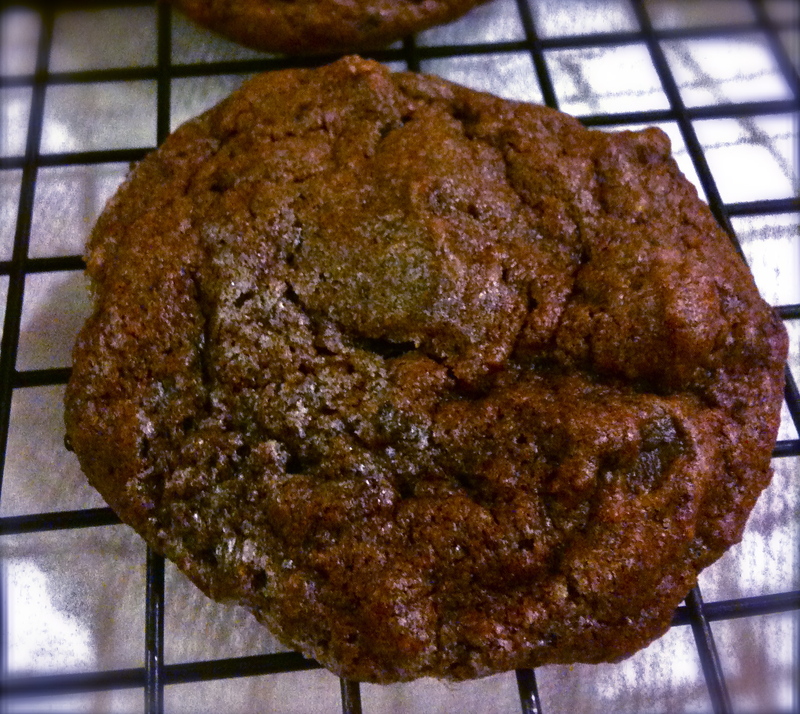 These Double Chocolate Espresso Cookies fit the bill perfectly with a description stating, “chewy in the middle with pockets of soft chocolate.” They came out soft and airy, yet decadent as the two kinds of chocolate and espresso would suggest. Line a baking sheet with Silpat or parchment paper. 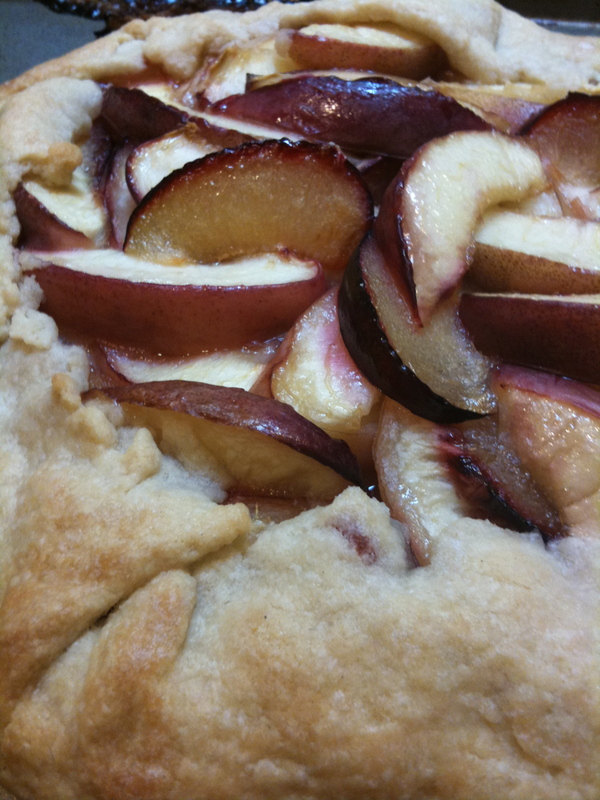 Using a 1 1/2″ ice-cream scoop, or rounded teaspoon, drop dough on the sheet 2″ apart. Bake for 10-12 minutes. Cool on a wire rack and serve. It started off as a joke. I told C & J that I’d craft a 90’s frat boy-style ice luge for their “Welcome to the Burbs” housewarming party. If you’re not familiar with ice luges, there’s apparently a wikipedia entry you can read here. I imagine a Siberian dude chiseled the first ice luge out of sheer boredom. 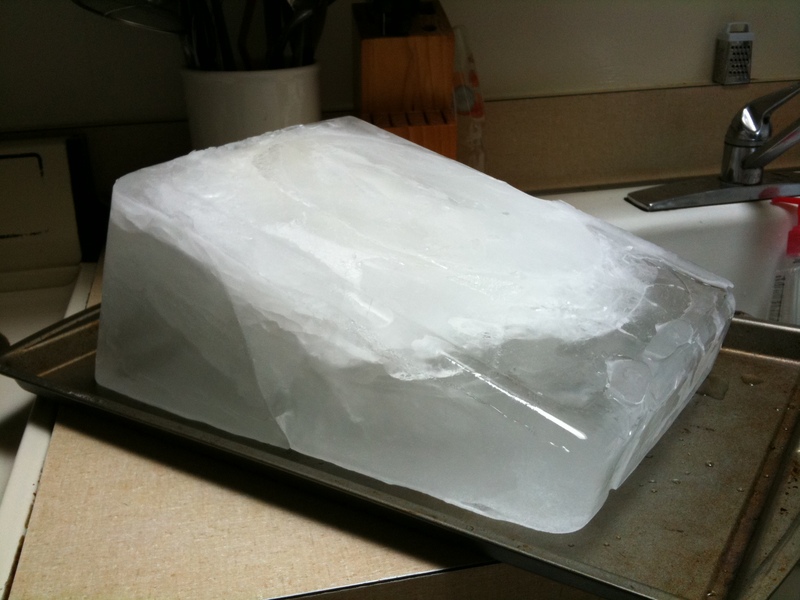 After some internet research, the prospect of building my own ice luge didn’t seem so intimidating. 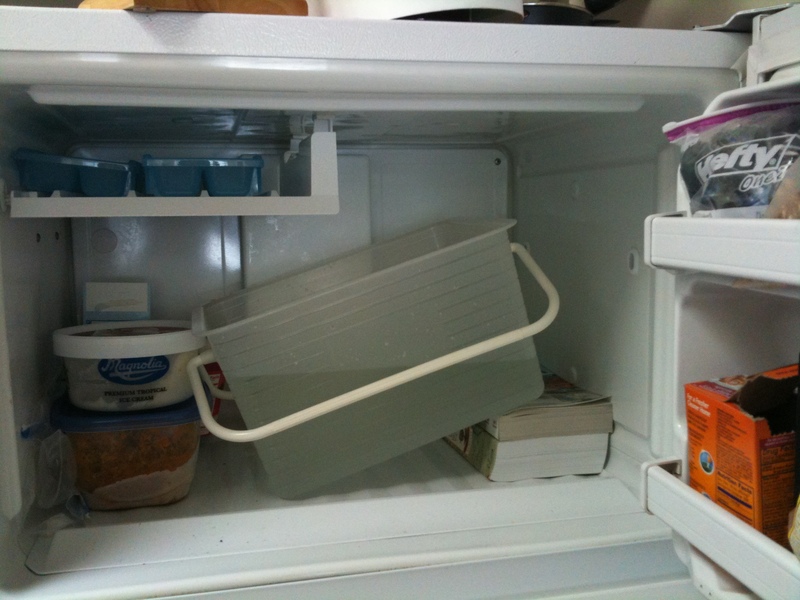 I’d start with a plastic storage box filled with water and frozen at a tilt in my freezer for two days. Next step, remove the ice from the container. 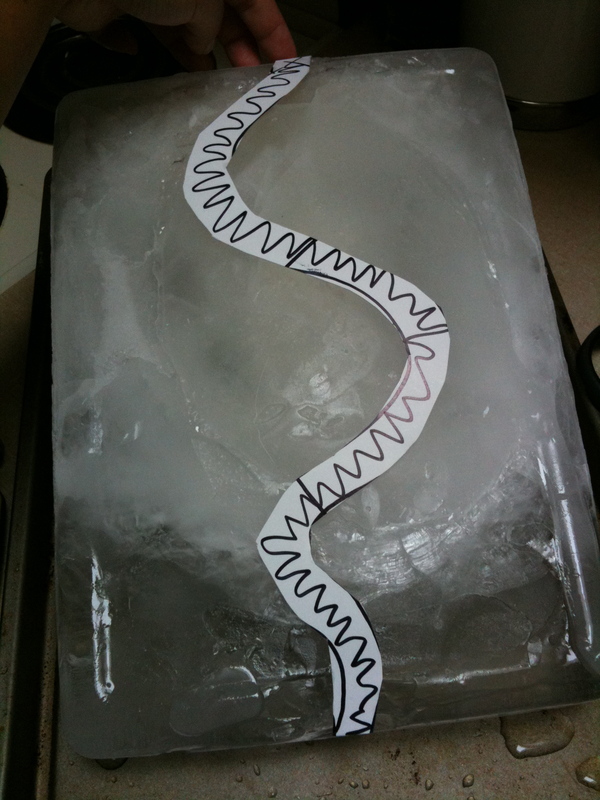 After 10 minutes of thawing on the counter, I carefully tipped the ice out of the box. I was skeptical at first because the container bottom had grown bulbous during freezing. 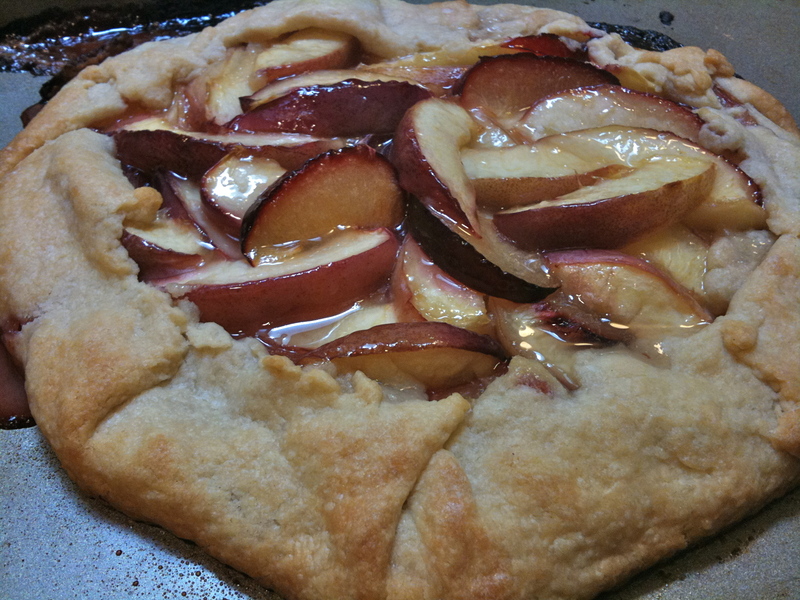 But, after thawing on a baking sheet, the bottom flattened itself. Also, the surface appears cloudy due to cracking. I blame air bubbles and uneven temps in the freezer. Next, I decided to create a paper pattern for the squiggly channel I was about to carve, so I wouldn’t have to free-hand it. Using a flat head screwdriver and hammer, I chiseled an outline around the paper pattern, then went back and chipped out chunks to form a half-inch deep channel. The cracks under the surface of the ice at times caused large chunks to break off, but you really don’t need to be precise here…. it is what it is! Last step: I poured a bit of warm water down the channel to smooth out the luge course and deepen it. All told, it only took me about 20-minutes to create the ice luge. 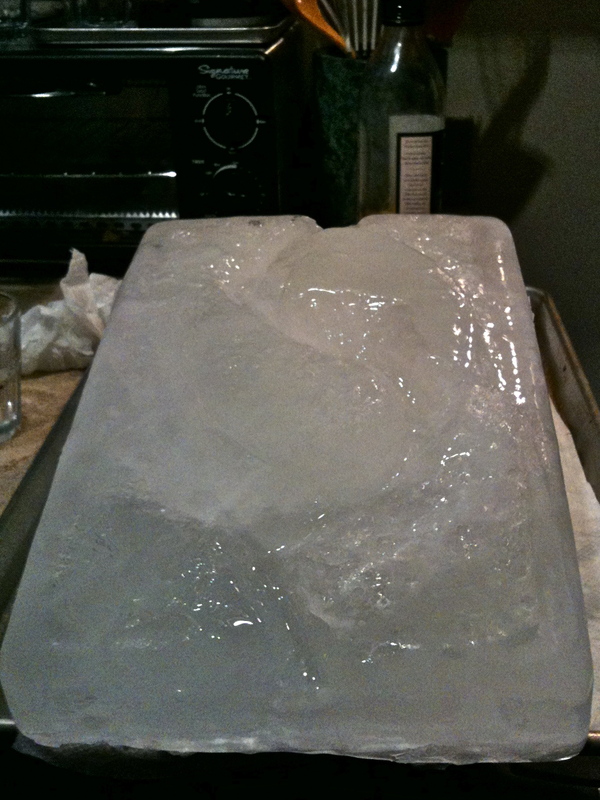 Handily, I plunked the ice luge back into the container I froze it in, which has handles for carrying. And off to the burbs I went! I’m an avocado monster. This is what California has done to me. Here, avocados are like cheese. You put them in any food that requires assembly — burgers, salads, sushi, omelets, egg rolls… anything goes! I still enjoy avocados most in their purest form, halved with a bit of soy sauce and a spoon. That’s how we grew up eating them in Hawaii. My grandma would walk down the block every day to check if any of the neighbor’s delicate “pears” had fallen to the ground street-side (i.e. “up for grabs”). These days, I hit up my local farmer’s market for the super ripe hass avocados — perfect for guacamole making. I’ve been making guacamole for years now with on-par results, but it wasn’t until a couple years ago that I was introduced to the ultimate recipe. I get compliments every time I make this for a party, and everyone always asks for the recipe. There aren’t any special spices, just well-measured ingredients and traditional grinding (preferably in a molcajete). 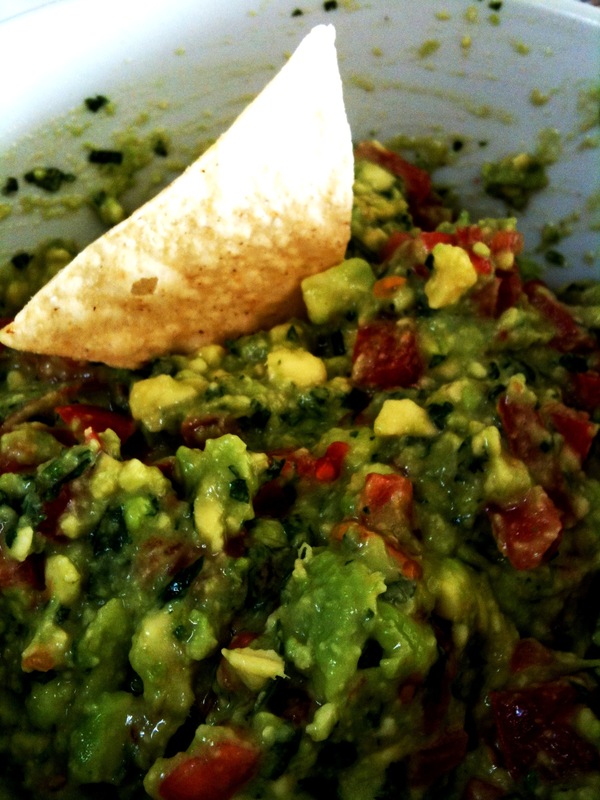 I have my foodie friend Christina to thank for introducing me to this guacamole of perfect proportions. Cut avocados (about 8 ounces each) in half. Twist the halves to separate them and remove the pit with the tip of the knife. Place an avocado half, cut side up, in your palm and make 3 or 4 evenly spaced lengthwise cuts through its flesh down to the skin, without cutting through the skin. Make 4 crosswise cuts in the same fashion. Scoop the diced avocado flesh into the molcajete. Repeat with remaining avocado halves. Gently fold the avocado into the chile–onion paste, keeping the avocado pieces fairly intact. Add lime juice, tomatoes, remaining 2 tbsp. of the cilantro, and remaining 1 tbsp. of the onions. Fold together all the ingredients. Taste and add salt, if necessary. Sometimes I add a dash of soy sauce instead of salt for extra umami! Serve immediately, directly from the molcajete (or bowl), with tortilla chips. It’s the middle of July and currently 59-degrees here in San Francisco. WTH!!!!! Beyond our 7 square mile bubble, it is the height of summer and refreshing cocktails are in demand. 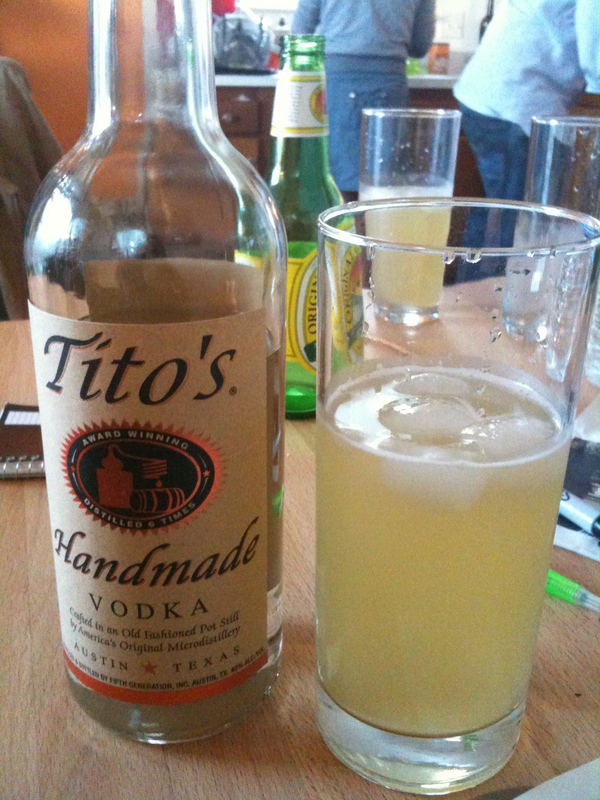 Recently my New Yorker foodie friend Jenny visited and whipped us up a batch of quenching Moscow Mules. I fell in love with this tangy citrus ginger cocktail, which Jenny served shamelessly in oversized water glasses. 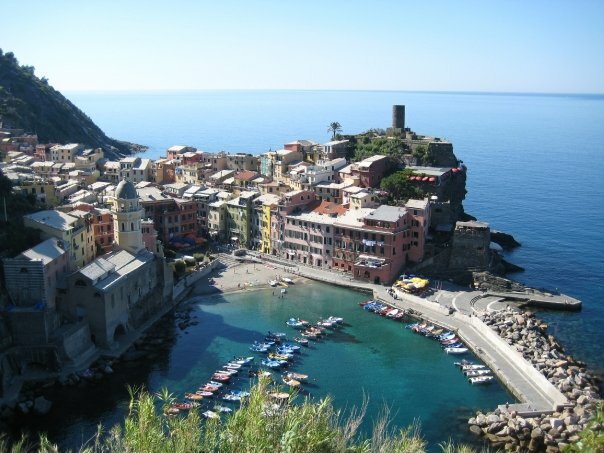 A couple summers ago, I took a trip to the Cinque Terra in Liguria, Italy. I snapped this photo of Vernazza from the hiking trail that connects these five picturesque coastal towns. The castle tower in the distance was built to watch out for pirates (yaaaargh!). Just below the tower, I enjoyed a fantastic meal of frutti di mare and pesto lasagna at the restaurant with orange awnings. Memories of that heavenly, melt-in-your-mouth pesto lasagna — infinite layers of handmade pasta, white sauce, cheeses, no tomatoes or meat — came rushing back after reading a recent Bittman article about Pra, Liguria’s famous basil-growing town. Pesto is pesto, and it’s pretty difficult to botch up a handful of nuts, cheese, basil and oil. On the other hand, if you’ve had truly great pesto made with the best Italian-grown ingredients, you know it can be an utterly transcendent experience in shades of green. Here in San Francisco, Farina is the hands-down pesto champ, but they don’t do a lasagna! Until my next trip to the Italian Rivera, I will continue to dream of pressing my fork greedily through a piece of fantastic pesto lasagna. In the meantime, I will take the basil California gives me. Preheat the oven to 350°. Spread the walnuts on a baking sheet and toast for 8 to 10 minutes, until they are fragrant and lightly browned. Let cool completely. In a food processor, pulse the walnuts with the basil and garlic until the walnuts are finely chopped. 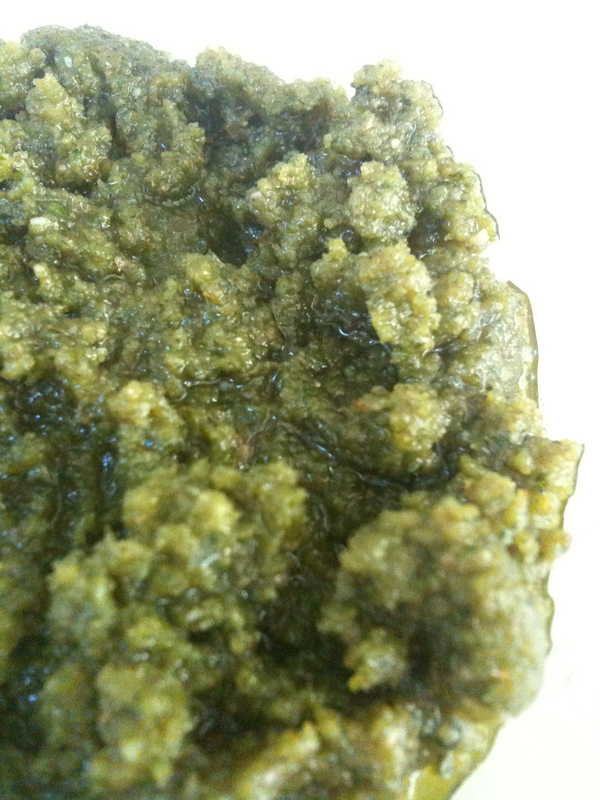 With the machine on, add the olive oil in a thin stream and process until the pesto is almost smooth. Add the cheese and pulse until just incorporated. Season with salt and pepper.